American River College’s soccer team lost its most recent game against Napa Valley College 1-0, a game in which defense dominated as the only goal of the game came early in the first period. That score came from forward Sebastian Bouchet at the 40 minute mark. After the score, ARC was on the attack holding Napa on their side and pushing aggressively on offense. ARC held Napa to their side of the field for most of the game. At the beginning of the second half, ARC started off strong and looked to have better communication, and good momentum. Despite the second half start, the results were still disappointing, according to head coach Paul Hansen. “We were hoping to dominate them,” said Hansen. ARC tried to deliver on that hope, but Napa played a strong and heavy defense as it tried to protect its one goal. Napa had a few more charges on offense, but ARC goalie Andres Olemeda was able to hold them off. “Finishing the game is something we need to work on more,” said freshman forward Brandon Barbounis. After the game, Hansen spoke to the team, telling them to keep their heads up, to stick together as a team, and spoke on a few things the they needed to work on going forward. “We all know we could have done better, and our communication is something we need to work on,” said freshman forward Francisco Lomeli. ARC will look for its first win of the season next week in its conference opener game against last years number two ranked Modesto Junior College. MJC is currently 4-1 and is coming in with a four game winning streak and is ranked number one in the Big 8 conference. 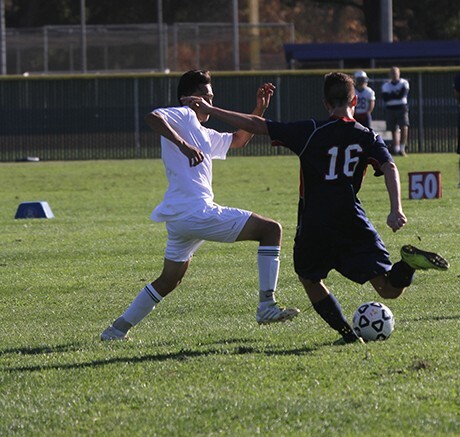 Be the first to comment on "ARC offense stagnant again in 1-0 loss to Napa Valley College"